Over the course of building Good Sir Martin and Penny Lane, Martin put in 754 hours and Penny put in 481. Other volunteers brought the total for the two trails to 1882 hours. Martin and Penny demonstrate the use of a clinometer, used to measure the steepness of a proposed section of trail, to a group of trailbuilding students. Before beginning to build, Martin spent several days hiking around the area while deciding where the trail should go. He flagged a rough line using yellow tape, which was gradually refined as the work progressed. Martin placing rocks at the Infamous Corner 3, so-called because of the large amount of rockwork needed to support it. Over half of the rockwork was buried to help blend it into the surrounding forest. 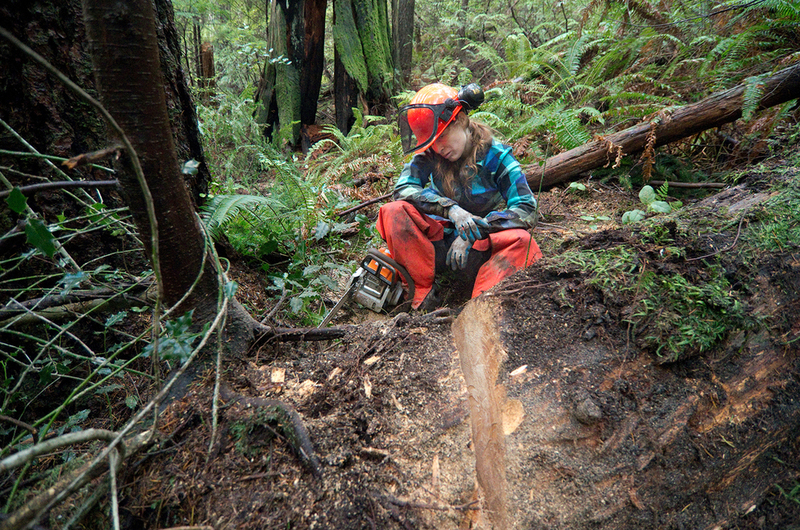 Penny taking a break while cutting a fallen log. The chainsaw blade became dull quickly thanks to debris on and around this kind of deadfall, requiring frequent manual sharpening. During the winter months, it would be dark well before heading into the trail after work. The mountain would be largely empty, and they would play music to mask the sounds of the forest. When working in the dark on weeknights, Martin would set his phone alarm for 9:00 PM to remind him to start thinking about going home for dinner. Martin and Penny would often put in 3 to 4 hour evenings after work, 2 or 3 times per week, and then 8 to 11 hour days on the weekends. Their longest day was 14 hours. While the trail was being built it ended in the middle of nowhere. Because of that, riding up it would have required riding back down which could have damaged the trail as it was not designed for downhill biking. And so, Martin and Penny hid the entrance deep in the forest and left a note asking curious people to proceed only on foot. Martin’s initial estimate of opening in 2017 was intended to give them some breathing room. Martin and Penny would sometimes hike their bikes into the trail to test out new sections to make sure there were enough spots to rest and that the corners weren’t too tight. The Infamous Corner 3 in particular was difficult to gauge, and was further refined after testing. While the exit was in the middle of nowhere and the entrance was hidden to prevent inadvertent damage to the unfinished trail, the builders were careful to not be seen. They went in and out when no one was around, carried their bikes, and took many different routes to minimize damage to the surrounding forest. Alex and Maddy were amongst the first to discover the trail while walking their dog. This note became a special keepsake for Martin and Penny. After leaving the note, Alex and Maddy often came out to help in terrible weather, usually bringing along their dog Harrison. They became good friends with Martin and Penny — Martin said that their cheerfulness really “kept us going” during difficult times. Bench-cut trail (trail cut into the side of a hill) was among the easiest to dig because it was its own source of “gold”. Gold is a sand-like dirt found at varying depths under the top layer of soil throughout the forest. It’s used as the final layer of the trail because it dries hard and thus resists erosion from feet, bike tires, and water. 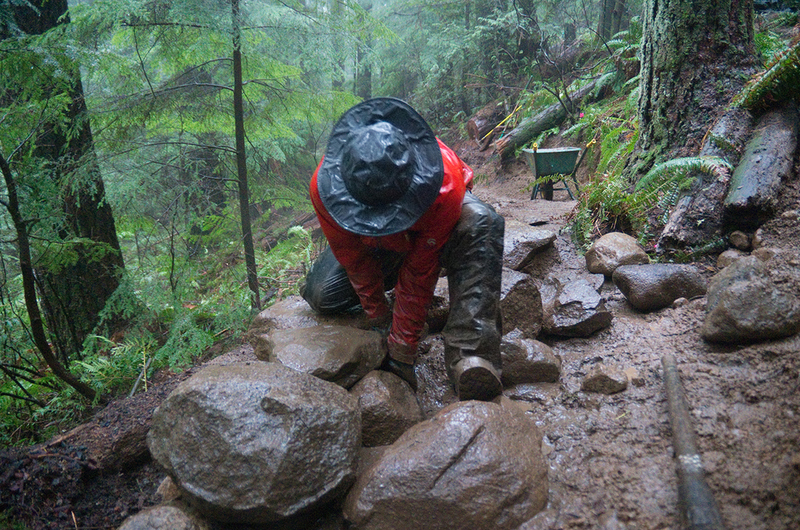 The majority of the time, gold had to be found off the trail in the forest and hauled over by hand. October 13, 2014: The creek crossing was the only part of the trail that didn’t change location over the course of the build. May 18, 2015: Martin and Penny used as few bridges as possible because they will eventually degrade and have to be replaced. Nevertheless, bridge-building was everyone’s favourite day. For the opening of Good Sir Martin, Martin and Penny were joined by many of the regular volunteers who had helped them over the past several months. After building the final few metres of trail, there was champagne and a ceremonial ride up the trail. After working for so long out of sight, Martin and Penny looked forward to the day that people could finally ride up the finished trail.